In a span of one year, 300 farmers in Kerio valley in Kenya earned over KES 4.8 million (USD 46,978) by cultivating 44.5 ha of green grams and over KES 4.2 million (USD 41,106) through cultivation of 161.8 ha of groundnuts. These farmers were trained in increasing productivity of dense legumes (groundnuts, green grams) and cereals (millets and sorghum). High quality seeds of green grams and groundnuts mainly KS20 variety, CG 7, and ICGV 90704 that are well adapted to hot dry areas of Kerio valley were released to farmers. 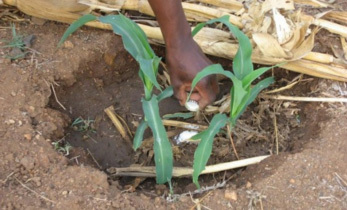 Farmers were trained on improved planting practices. Prior to this, farmers used to plant less seed (4 kgs per 0.4 ha instead of 8 kgs per 0.4 ha) which reduced their yield to 3-4 bags per 0.4 ha instead of 7-8 bags per 0.4 ha. 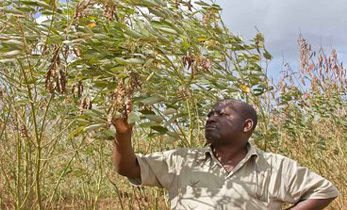 Due to the combination of providing high yielding improved seeds and training on better agronomic practices farmers in four areas (Kapkayo, Biretwo, Kabulwo and Arror) tripled their acreage to 364 ha for groundnuts and increased monetary gains from KES 4 million (USD 39,149) in 2015 to KES 25 million (USD 244,682) in 2016. Green gram production also increased significantly from an area of less than 48 ha to over 116 ha with total incomes increasing from KES 2.8 million (USD 27,404) in 2015 to 5.6 million (USD 54,808) in 2016. As harvest improved, farmers were briefed on the benefits of collective marketing of produce through aggregation centers at Arror, Kabulwo, Biretwo, Kapkayo and Cheplambus for better price negotiation. 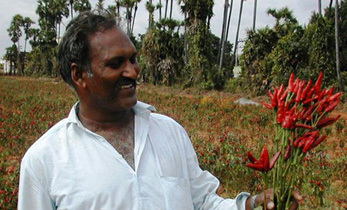 Due to aggregation, market access became easier for farmers. For example the Greenforest Company Ltd. based in Nairobi is currently buying the unshelled groundnut at KES 70 (USD 0.68) and green gram at KES 125 (USD 1.22) per kilo. In addition farmers were trained on correct spacing, timely planting, importance of earthing-up for groundnut to facilitate better pod formation, pest (pod borers, cutworms, aphids) and disease (mainly early blight, cerspora leaf spots and Groundnut Rossette virus) control. 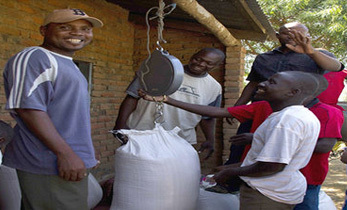 Purdue Improved Cowpea Storage (PICS) bags were introduced to farmers to manage post-harvest loses. Additionally, the bags have been effective in maintaining seed integrity up to next planting season as the bag maintains low levels of oxygen and higher levels of carbon dioxide killing all insects. 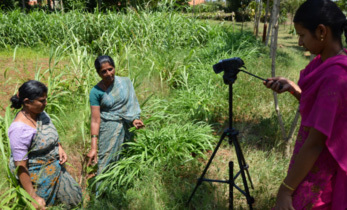 Adequate promotion of above mentioned practices and technologies has enhanced the adoption of improved varieties, increased the awareness, contributed to inclusive agricultural growth and availability of surplus for marketing as well as food self-sufficiency at households. 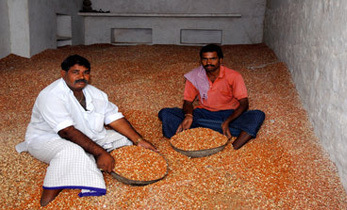 Consequently, nutrition has been improved due to enhanced consumption of high value legumes (pigeon pea, groundnuts, green gram) and cereals (sorghum, finger and pearl millet) reducing dependence on livestock for livelihoods.